I went into the first trimester with the hopes of really kicking this pregnancy off with a super healthy start and honestly I fell short. The morning sickness set in hard and having an active toddler who doesn’t always like to nap through me for a bit of a loop. While this time around my food aversions were a bit more mild my gag reflex has been on over drive. I know maybe a little TMI but I’m just going to tell it like it is. I have for the most part been able to stick to healthier eating because I still want salads, fruit, and other veggies unlike Edith’s pregnancy when all I wanted was citrus and bagels. However because my gag reflex has been so sensitive eating can be a challenge at times. Now I’m not talking vomiting (although that has happened this time which it didn’t with E) I am talking gagging like extreme gagging. Please tell me there is some other mama or mama-to-be out there that experienced this terrible pregnancy side effect. The worst part is drinking water actually triggered my reflex at times so I haven’t been drinking as much water as I should. 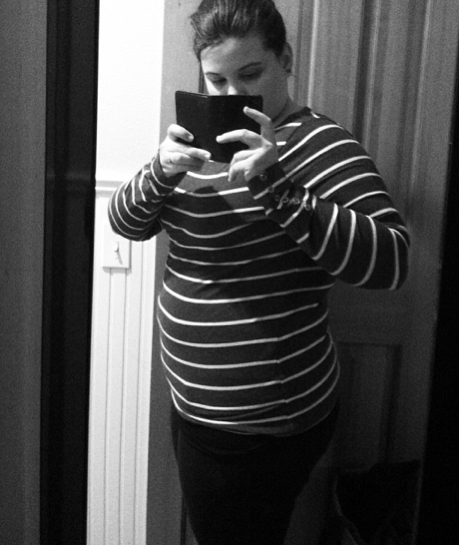 To top things off in the first trimester I was not getting in my workouts. A big part of this was just pure laziness. I was tired all the time due to the first trimester hormone rush and the fact that Edith went through a nap regression ie. she wouldn’t nap or would only nap on me. So getting in naptime workouts was a struggle and honestly when I did get a break I wanted to sleep instead of workout. At night I was going to bed at 7:30p with Edith because I was so exhausted. So lets fast forward to the last few weeks. I finally am getting my energy back, my reflex has calmed down (although not disappeared) and I have been way more active. Neil and I got a couples gym membership to our local community center and it has been great because I get in a few workouts there per week and Edith and I go to the pool a few times per week. I am not getting in my goal of three gym workouts per week yet but I am working on it (right now I’m at 1-2). I also have been making more time to do workouts at home and have overall been more active while at home (ie. not sitting on the couch, laying in bed or just sitting around on the floor playing with Edith). Drink 70-100oz of water per day. I know that sounds like a lot to some of you but when you are pregnant you need to drink more water than you normally would. Right now I am closer to 64oz so I am working hard to increase that. One thing that I have been making an effort to do is to drink 1L of water first thing in the morning before I even eat. I find that this really helps me to stay on track during the day. Workout 5 days per week. This is going to include a combination of at home workouts, walks during the day and gym workouts. Currently this is in the goal stage as I am consistently getting closer to 3 workouts per week. Time to up my game! Bi-Weekly Prenatal Yoga (at a studio). This time around prenatal yoga is a little more challenging for me to get to due to Neil’s work schedule and the fact that many classes are during the day. When I was pregnant with Edith I didn’t have a toddler to care for as well so I was able to go 1-2x per week. This time around I am hoping to go at least every other week. I haven’t yet found a studio but I did some research this week and found two that offer a weekend class that I should be able to attend. So over the next few weeks I am going to go to both and see which one I enjoy more. Eat 90% of meals at home. First trimester sickness and tiredness really put us in a downward spiral of eating too may meals outside the home or takeout meals. I would do great for breakfast, lunch and snacks but come dinner time I was wiped out. So we would turn to take out or dining out and although we tried to make healthier choices when doing so it will never be as healthy as eating at home. What tips do you have for staying fit and healthy?